Once again we've come up with several interesting stock suggestions based on the results of combining two of the stock screens that we ran this weekend at TradeRadar. Being somewhat under the weather and distracted by the Super Ball prevented me from posting this on Sunday but hopefully it's better late than never. Trend Leaders represents a collection of stocks in strong up-trends. 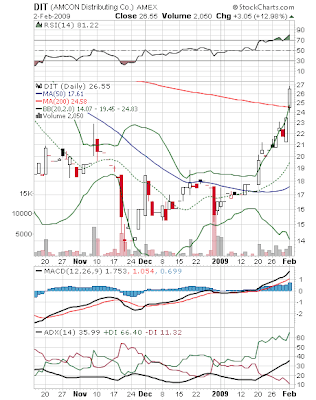 These stocks are registering strong signals using Aroon analysis, DMI and MACD. They are also above their 50-day exponential moving average. To obtain the list of Cash Flow Kings we calculate the free cash flow yield of all the stocks we scan and pick the ones whose yield is 50% or greater. All these screens generate big lists since we run them against essentially the entire stock market. Combining the Trend Leaders and the Cash Flow Kings results in what I think of as the "Leadership Screen" as it brings together those stocks with price momentum and exceptional cash flow yield. This week there are four stocks in common on both lists. Two are repeats from previous weeks and two are new. AMCON Distributing Co. (DIT) - this stock has been on a tear since the year began. Not being very well-known, it's worthwhile to offer a few details on this company. AMCON Distributing is in the Consumer Goods & Services sector in the Food Distribution & Convenience Stores industry. The company operates two business segments: a wholesale distribution segment (ADC) and a retail health food segment. The distribution segment serves approximately 4,000 retail and institutional outlets in the Great Plains and Rocky Mountain regions. Products distributed include cigarettes and tobacco products, candy and other confectionery, beverages, groceries, paper products, health and beauty care products, frozen and chilled products and institutional food service products. The health food segment operates 13 retail health food stores in Florida and the Midwest offering natural supplements and herbs, dairy products, and organic produce. It's true that this is also a micro-cap with a market cap of only $15 million but it has some nice looking financial ratios: P/E just under 4, price-to-sales of only 0.02, price-to-book of 1.1. Then there is the dividend. The current dividend yield is 1.7% which is no big deal. What is important to note is that, first of all, this is a micro-cap that is paying a dividend and that alone is striking. What may be more important is the fact that the company has increased its dividend while in the midst of a severe recession, most recently in November of 2008. As can be seen in the chart below, AMCON had a great day today, rising $3.05 to $26.55, a nearly 13% gain. The stock is now above it's 200-day moving average and all indicators are currently very positive. The worry is that the rapid gains in the stock are leaving it more and more at risk of a pull-back. In the meantime, the distribution segment is probably one of the few businesses that may be less susceptible to the current economic downturn. The company is not selling high priced items. It distributes consumer staples and inexpensive treats and it is growing earnings year-over-year at a double-digit rate. If you're willing to consider an interesting micro-cap, this stock might very well merit a spot on your watch list.